Footloose is a 1984 American musical comedy-drama film directed by Herbert Ross. 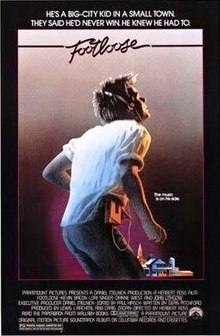 It tells the story of Ren McCormack (Kevin Bacon), an upbeat Chicago teen who moves to a small town in which, as a result of the efforts of a local minister (John Lithgow), dancing and rock music have been banned. Ren McCormack, a teenager raised in Chicago, moves with his mother to the small town of Bomont, Utah to live with his aunt and uncle. Soon after arriving, Ren befriends Willard Hewitt, and from him learns the city council has banned dancing and rock music. He soon begins to fall for a rebellious teenage girl named Ariel, who has an abusive boyfriend, Chuck Cranston, and a strict father, Shaw Moore, who is a reverend of the local church. Despite further discussion with Ren about his own family losses in comparison to Moore's losses and Ariel's opening up about her own past, disclosing that she has had sexual relations, Moore cannot bring himself to change his stance. His son Bobby was killed in a car crash while returning from a night of dancing, resulting in Moore's arranging to ban music and dancing in the community. However, he has a change of heart after seeing some of the townsfolk burning books that they think are dangerous to the youth. Realizing the situation has gotten out of hand, Moore stops the book-burning, rebukes the people, and sends them home. Dean Pitchford wrote the screenplay (and most of the lyrics) for Footloose, with Herbert Ross directing the movie, and Paramount Pictures co-producing and distributing the film. Tom Cruise and Rob Lowe were both slated to play the lead. The casting directors were impressed with Cruise because of the famous underwear dance sequence in Risky Business, but he was unavailable for the part because he was filming All the Right Moves. Lowe auditioned three times and had dancing ability and the "neutral teen" look that the director wanted, but injury prevented him from taking the part. Bacon had been offered the main role for the Stephen King movie Christine at the same time that he was asked to do the screen test for Footloose. He chose to take the gamble on the screen test. After watching his earlier movie Diner, the director persuaded the producers to go with Bacon. The soundtrack was released in cassette, 8-track tape, vinyl, and CD format. The soundtrack was also re-released on CD for the 15th anniversary of the film in 1999. The re-release included four new songs: "Bang Your Head (Metal Health)" by Quiet Riot, "Hurts So Good" by John Mellencamp, "Waiting for a Girl Like You" by Foreigner, and the extended 12" remix of "Dancing in the Sheets". The late film composer Miles Goodman has been credited for adapting and orchestrating the film's score. Jane Lamacraft reassessed the film for Sight and Sound's "Forgotten pleasures of the multiplex" feature in 2010, writing "Nearly three decades on, Bacon's vest-clad set-piece dance in a flour mill looks cheesily 1980s, but the rest of Ross's drama wears its age well, real song-and-dance joy for the pre-Glee generation." In 1998, a musical version of Footloose premiered. Featuring many of the songs from the film, the show has been presented on London's West End, on Broadway, and elsewhere. The musical is generally faithful to the film version, with some slight differences in the story and characters. Paramount announced plans to fast-track a musical remake of Footloose. The remake was written and directed by Craig Brewer. Filming started in September 2010. It was budgeted at $25 million. The release date was October 14, 2011. ^ "FOOTLOOSE (PG) (!)". British Board of Film Classification. February 20, 1984. Retrieved July 8, 2015. ^ Demaret, Kent (19 May 1980). "You Got Trouble in Elmore City: That's Spelled with a "t," Which Rhymes with "d" and That Stands for Dancing". People. 13 (20). Retrieved 12 May 2009. ^ Holleran, Scott (12 October 2004). "Shall We Footloose?". Box Office Mojo. Retrieved 12 May 2009. ^ Wenn (16 January 2013). "Rob Lowe: 'I refused to sing Footloose karaoke duet with Loggins". Hollywood.com. Retrieved 11 March 2014. Years ago I auditioned for Footloose and I blew out my ACL (anterior cruciate ligament), so I have post-traumatic stress with anything having to do with Footloose. ^ "Hoofers Hidden in the Shadows Dream of the Limelight". People. Time Inc. 2 April 1984. Retrieved 15 December 2011. ^ Jones, Oliver (14 October 2011). "Kevin Bacon 'Furious' over Having a Dance Double in Footloose". People. Time Inc. Retrieved 18 October 2011. ^ "Miles Goodman, 47, Composer for Films". The New York Times. 20 August 1996. Retrieved 25 March 2015. ^ Jablon, Robert (18 August 1996). "MILES GOODMAN, FILM COMPOSER AND JAZZ RECORD PRODUCER, DIES". Associated Press. Retrieved 25 March 2015. ^ Oliver, Myrna (20 August 1996). "Miles Goodman; Record Producer, Film Composer". Los Angeles Times. Retrieved 25 March 2015. ^ "Miles Goodman: Composer". Sarasota Herald-Tribune. 22 August 1996. Retrieved 25 March 2015. ^ "Record producer, composer Miles Goodman dies at 47". The Daily Gazette. 21 August 1996. Retrieved 25 March 2015. ^ "Miles Goodman, Composer For Films". Sun-Sentinel. 21 August 1996. Retrieved 25 March 2015. ^ Denby, David (February 27, 1984). "Schlockdance". New York. 17 (9). p. 60. Retrieved 18 October 2011. ^ Lamacraft, Jane. "forgotten-pleasures-of-the-multiplex". Sight & Sound. British Film Institute. Archived from the original on 8 November 2011. Retrieved 18 October 2011. ^ "Footloose (1984)". Rotten Tomatoes. Fandango. Retrieved April 29, 2018. ^ "Footloose (1984) Reviews". Metacritic. CBS Interactive. Retrieved April 29, 2018. ^ "Box office/business for Footloose (1984)". Internet Movie Database. Retrieved 12 May 2009. ^ "AFI's 100 Years...100 Songs" (PDF). American Film Institute. Retrieved 2016-08-14. ^ Willis, John (1 June 2002). Theatre World 1998-1999. Hal Leonard Corporation. p. 20. ISBN 978-1-55783-432-4. ^ John Beifuss. "'Footloose' runs off with well-heeled suitor: Georgia". MCA. Look up footloose in Wiktionary, the free dictionary.